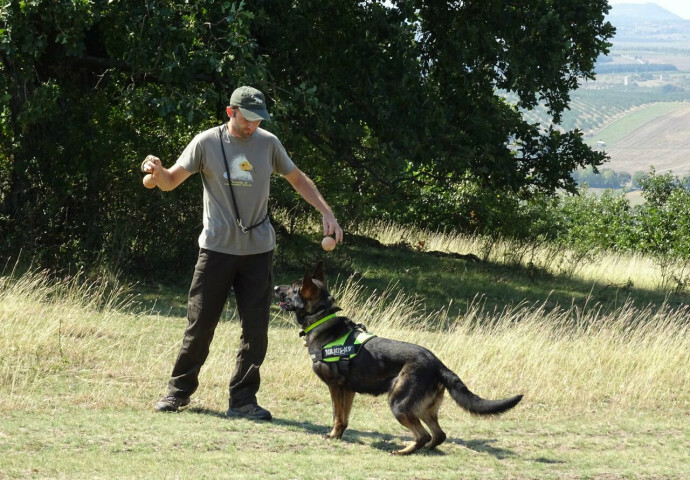 This summer, Nikolay Terziev from the Bulgarian Society for the Protection of Birds (BSPB) spent nearly two months in Hungary where he was trained as dog handler for the first Antipoison Dog Unit in Bulgaria. The main objective of the Unit is to create poison-free areas by controlling and removing poisoned baits before they can cause damage. by MME – Hungarian Birdlife partner. Nikolay and Bars, the trained dog, returned to Haskovo recently, where they will be based and soon start patrolling the feeding territories of the griffon and black vulture colonies in the Rhodope Mountains rewilding area. 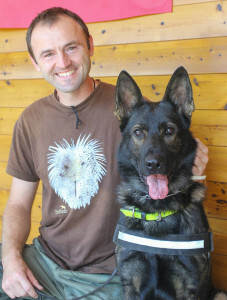 The dog has been specially trained by Magyar Madártani és Természetvédelmi Egyesület (MME) Birdlife Hungary to search and detect dead animals and poisoned baits. This training is part of the actions against the illegal use of poison within the framework of the LIFE Project “Conservation of black and griffon vultures in Rhodope Mountains” (LIFE-Vultures). Despite being illegal, poisoned baits and carcasses are put out with the aim of killing foxes, jackals, wolves and other animals seen as a threat to livestock. When these events happen in the areas where vultures breed or feed, the results can be potentially disastrous. Nelly Naydenova, Communications Officer of the Rewilding Rhodopes team in Bulgaria, interviewed Nikolay Terziev and asked questions about his work for the LIFE Vultures project. Nikolay, tell us more about training: Where did it take place? What have you learned? The training was held in Hungary at a special dog training center which is already active for nearly 60 years. Before I joined Bars’s training, he had allready passed a period of preparation by professional dog trainers. The dog has been selected amongst other dogs in the “dog academy”. Bars has distinguished himself ­­­­­­for his acute sense of smell which made him suitable for his future task – detecting poisoned animals. Finding poison baits is a difficult and dangerous task for dogs and quite challenging for dog handlers too. During the training we were using real poisoned baits, exposing him to mainly two types of pesticides that could cause poisoning and are often used in Hungary and Bulgaria. What is the main task of the Antipoison Dog Unit? The main objective of the of the Antipoison Dog Unit is to create, as far as possible, poison-free areas and deter people from using this illegal method. Our work is to control and remove poisoned baits, put out deliberately by people, and animals that are suffering or are allready dead from poison, in a timely manner, before they can cause further poisoning. The Antipoison Dog Unit will cover mainly the region of the Eastern Rhodopes. We will patrol places where a poisoning incident had taken place recently or where new poisoning incidents have been reported by Forestry Services, Environmental agencies and local people. We also hope we will be able to set a baseline – some trends, results and analyses from the team’s work that might help in successfully continuing with this action in the future. In Hungary the Antipoison Dog Unit regularly works with the Hungarian authorities about poisoning incidents and our unit will also collaborate with Bulgarian police authorities. What are the next steps and is the team ready to start its work? Dogs, just like humans, have specific character and behaviour so Bars and I are still getting used to each other before we start working as a fully functional team. What follows now is a very short period of adaptation for Bars and I hope within few months we will start our active work in Eastern Rhodopes. At the moment Bars is becoming familiar with the new surroundings of our home in Haskovo, where our mobile team will be based. It takes time to build the trust among the partners, make a good team and we are only at the beginning of this long process. This requires full understanding of the dog’s behavior. It is extremely important for these dogs to get used to the new environment, explore new smells and visit new areas. Rhodopes Antipoison Dog Unit – Nikolay and Bars. 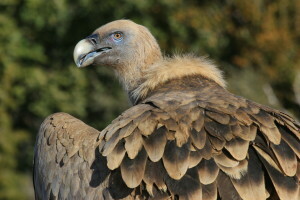 Is poisoning the main threat to black and griffon vultures? We have no specific data on how many black and griffon vultures were killed by poison, but the poisoned baits are believed to be one of the main threats and causes of death for vultures and other rare and endangered birds that scavenge. It is not so common in Bulgaria but even a single poisoning acccident can kill a significant part of the Rhodopean vulture population as the vultures tend to congregate and feed in big groups. What would be your and Bars’s tasks within the dog unit? Bars’s work will be to patrol and search the designated areas for poisoned baits and animals. He can find animals that die for other reasons as well, like poaching or natural causes. Once he detects a dead animal, his “job” would be to send a “barking” signal. My part is then to assess the case since the death of the animals in most cases is due natural. If it turns out, however, that the animal is poisoned, it must be instantly removed from nature. In that case, my task is also to collect samples from the dead animals and send it to the laboratory to identify the cause of death and the type of used poison. What does foreign experience show: is an Antipoison Dog Unit the most efficient method to combat poisoning? The method has already proved effective and is showing encouraging results in countries like Spain, Hungary and Greece. Hungary registered a serious decrease in the number of cases of poisoned animals, which is the merit of Falco (their dog). The four-legged assistant of the Hungarian ornithological organization has discovered more than 800 poisoned animals. In Greece a similar dog team worked for several years to better protect Egyptian vultures and our colleagues there have managed to prevent hundreds of cases of poisoning. Another important element is active communication and education campaigns regarding the various damages caused by poisons. According to your experience why are people still using poisons? The main drivers for the use of poisoned baits are predator extermination, stray dog population control and human conflicts between shepherds and hunters. Another problem appears to be the naturally disposed pesticides and other potentially hazardous agricultural waste. The truth is that the way to combat them is extremely ineffective as most predators (in particular wolf, fox and jackal) are highly intelligent animals. They sense that if something is wrong they usually don’t eat from the poisoned animal. Therefore, victims of poisoning are often not these smart predators, but different species like buzzards, eagles, vultures, martens and other small predators which are not the targeted animals. Our Antipoison Dog Unit will help in “cleaning” the area from dangerous baits and hopefully we will save a lot of animals – both wild and domestic – from poisoning.